Notes: Liqueur Pisa is a unique blend of Hazelnut, Pistachio and Almond (nuts that have grown around the city of Pisa in Tuscany for centuries) which are individually loved and appreciated, but once put together make a heavenly combination! It is a natural, high-quality product bottled in Italy. It has a very smooth taste, a complex mouth-feel and is easy to drink. Pisa, which is very smooth and easy to drink, offers a fantastic nutty taste that entices you to enjoy more. Drink Pisa Liqueur at room temperature to experience the wonderful flavors that almond, pistachio and hazelnut will bring you or add rocks to your liking and endeavor a completely different drink. 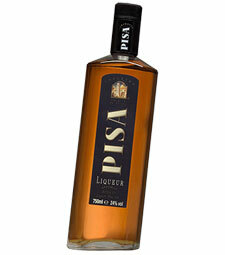 Pisa Liqueur is also fabulous in cocktails or adds a splash to your favorite desserts such as Ice Cream or Tiramisu.